Why did I make a paper bead tool? Making paper beads from junk is one of my favourite crafts. I have always loved transforming mundane pieces of paper into beautiful jewellery. I also love creating my own artwork to use. But my enjoyment was spoilt by not being able to roll the paper bead strips very easily. I wanted something that gripped the paper well enough to get the bead started easily. I also wanted something that would allow me to slide the finished bead off quickly, smoothly and without pulling the middle out of it. There have been many bead rollers for sale for many years but they were made from bamboo that has been split into two and then bound with paper to make a handle. They were ok and I made quite a few of my own over the years. The problem that I found was the bamboo could sometimes snag the paper making beads hard to slide off. So I created my own tools. Learn to Make Gorgeous Paper Beads In Minutes! Once you have the tool and have practiced on a few strips of paper, making beautiful beads is really easy. With the paper bead tool, you will never get mad at junk mail again! Instead, you will be saying thank you for all the wonderful free paper you are getting. And think of the thrill when you make a really beautiful bracelet out of something that used to annoy you! Make unique presents that have cost you next to nothing. Or create your own art work and make some really colourful beads that are truly unique and cannot be copied. The possibilities for creating paper beads of all different shapes and sizes is endless with the paper bead tool. I really enjoy colouring designs on plain paper and then making beads from it. If you add several coats of glaze, they look so amazing, no one guesses they are made from paper. After experimenting with lots of different materials for many years, I came up with a paper bead tool that I absolutely loved using. The design was nice and simple and very easy to use. It rolled nice tight beads that were easy to slide off and I was happy with that. I eventually made the tools in two sizes, 3mm and 5mm. The 3mm size allows you to make beads with a smaller core for threading on finer stringing material up to 2.5mm thick. The 5mm size allows you to make beads with a larger core for threading on thicker stringing materials such as leather or Pandora style bracelets. After the paper bead tool issue was conquered, I set about making myself templates to use over and over again so I didn\'t have to measure every time. For many years I used my drawn out templates with carbon paper because I had no printer or computer in those days. Eventually, I refined my templates to sell to other people that I was teaching in craft groups. In recent times, I extended that further to create downloadable templates for sale online that people can print off and stick onto their craft paper with removable glue tape while they cut with a craft knife. And then I designed a set that can be used with electronic cutters such as Silhouette Cameo. For easy cutting of paper bead strips without all the hassle of measuring and drawing lines, I have designed some templates you can download from my etsy shop. They are very easy to use. Click here to find out how you can use my templates to cut quick, easy strips and then use the template paper to make more beads so there is no waste! You can also use the templates in image editing software such as Photoshop to overlay onto printable designs. The one inch electronic template printed onto a design for easy cutting. There are two ways to use the downloadable templates. You can print the template, fix it to your chosen bead paper with removable adhesive tape and cut your strips along the lines with ruler and craft knife. The picture to the left shows strips cut with that method. As you can see, this gives you the strips cut in your chosen paper and the left-over template strips. You can hand colour those with Sharpies and make more beads. No waste! Or you can overlay the png file onto an image on screen (see the blue design above), print it and cut along the printed lines with ruler and craft knife or a guillotine. Visit my etsy shop today to get your downloadable templates. Please note - we have now changed the handle design of the Easy Beady Paper Bead Tool back to the original one I used when we first began making paper bead tools for my students to buy. The bead tool demonstrated in the video is the one that we produced to sell online to be lighter weight and easier for posting all over the world. There is an updated video here showing the new tools in action. The original handle we used was bigger and heavier and pushed up postage costs. However, my workshop students who have tried both handle styles over the years preferred the heavier, more curvy handle on the 5mm tool and most people said they found the grip better on the curvier 3mm tool handle. So we took the decision to sell the online paper bead tools with the old style handle. The straight handle tool is available on request. The new paper bead tools with the old style handles. The new paper bead tools with the paper bead strip stencil. The old style paper bead tools with the straight handle. We have also released our Easy Beady paper bead strip stencil templates for sale on Etsy. You can see the stencil in the picture above. It can be found on Etsy by clicking here. At the moment, when you buy both the new 3mm and 5mm curvy handled bead tools together, we are giving you the paper bead strip stencil template free at a saving of £5.99. Click here to go to the offer on Etsy. 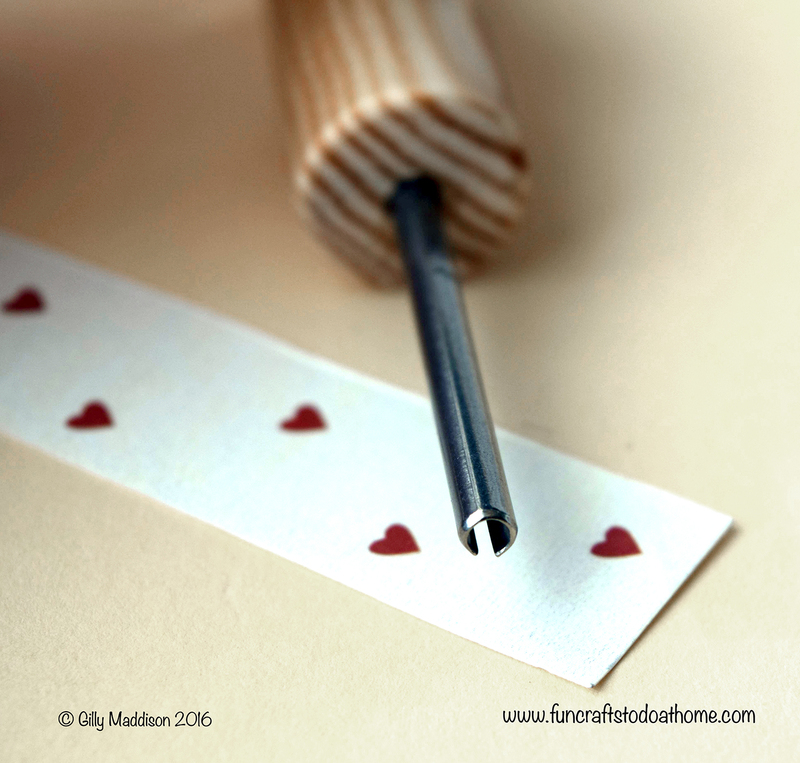 If you would like to start using a paper bead tool to make your crafting life easier - order my paper bead tools and templates today - you will be glad you did! Previous Previous post: Paper Bead Making – What’s It All About?